Omar Masood, owner of Omar&apos;s World of Comics & Hobbies, with store manager Sally Hoops. In Lexington Center hangs the image of a superhero soaring forward, his blue suit marked with a large letter “O” colored in the same bright yellow as his cape. The superhero is in the likeness of Omar Masood, a 22-year-old man with Down syndrome who just opened Omar’s World of Comics & Hobbies. The blue and yellow of the custom-made sign reflect the Lincoln resident’s colorful personality and represent the colors of the Down syndrome community. 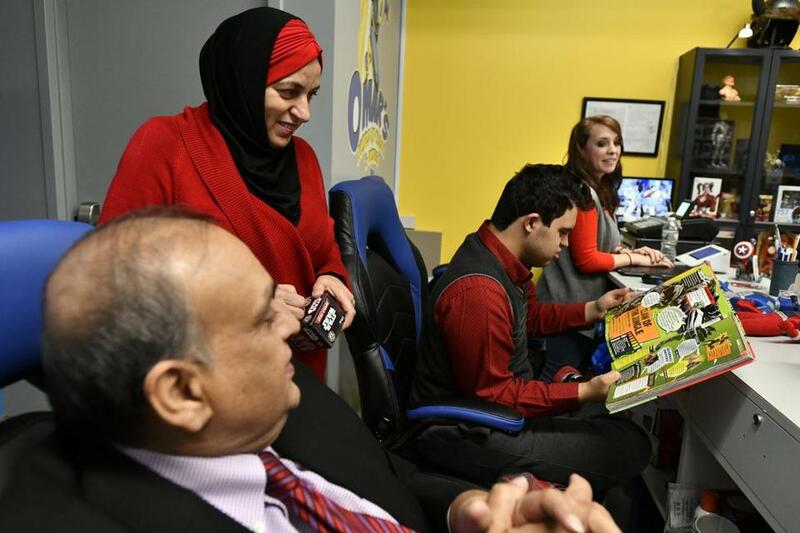 The image stands out among the mostly black and white signs of the businesses surrounding it, but for Masood and his parents, who are helping to fund the store, it was important that every bit of the shop reflect its purpose: to be a safe space for members of the disabled community. The Masoods are actively involved in helping the disabled community in Massachusetts. They are honorary members of the board of the Massachusetts Down Syndrome Congress, and they helped fund its first office in Burlington seven years ago. Since their son was a child, the Masoods have thought about what employment options he would have as an adult. The idea of opening a comic book store was birthed out of his love for and impressive knowledge of superheroes. Sohail and Mona Masood with their son, Omar, and store manager Sally Hoops. “Omar isn’t just at the store for the sake of being there. People who come in can see that he knows what he’s talking about, that he’s passionate, and can help customers to find what they need,” said Sally Hoops, the store’s manager. The shelves are filled with comic books, games, and T-shirts. Soon, video games will be added as well. At 22, students with disabilities age out of mandated school-based special education programs and services. As newly independent adults, they often face job and housing insecurity without the support system the services once provided them. The Masoods have been able to avoid that for their son, but not everyone is as fortunate. 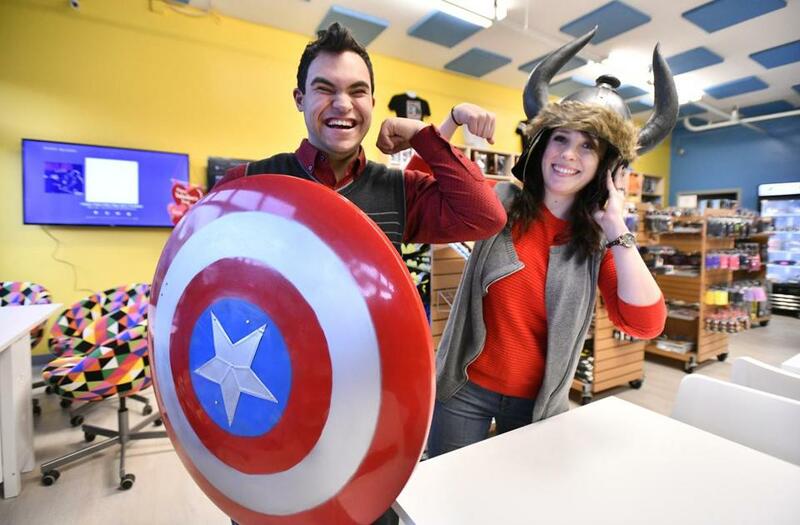 Omar’s World of Comics & Hobbies employs students with disabilities from Lexington High School’s LABBB Educational Collaborative, where he is also a student. The collaborative works in about a dozen schools in Lexington, Arlington, Burlington, Bedford, and Belmont to help students with special needs integrate their academic, social, and vocational lives. Store owner Omar Masood and manager Sally Hoops wait on a customer at Omar’s World of Comics & Hobbies. Three days each week, four LABBB students work as interns at the store. The interns stack shelves, take inventory, greet customers, and keep the area clean. Kristin Dailey, supervisor of the LABBB Transition Department, has worked with the Masoods to find each intern a perfect fit at the store. 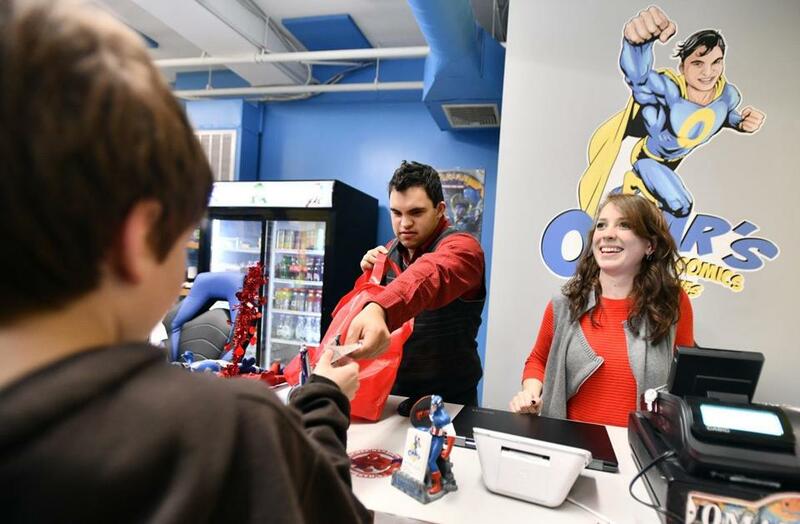 “The students working at Omar’s have an interest in comics, but they have potential to work in retail stores in their future,” Dailey said. Through their internships, LABBB students get experience in traditional roles such as pricing, inventory, and customer service, but can also practice skills like using iPads to process credit card purchases. LABBB internships are also in place at other local stores, including CVS, Whole Foods, and Marshalls. To help them on the job, interns receive visual and auditory directions and are paired with employees for support whenever possible. In this way, Dailey said, there’s something any person can do in every placement. The Masoods are in the process of getting nonprofit status for the store. Doing so will help them offset some of the operating costs by accepting donations, and will create a stronger relationship between the store and LABBB. Omar’s father said the family hopes to open several other stores across Massachusetts in the future. Sohail Masood is chief executive officer of KabaFusion, which provides infusion therapy services throughout the country. For the store’s namesake, the best thing about the shop is having the chance to share it with other LABBB students. 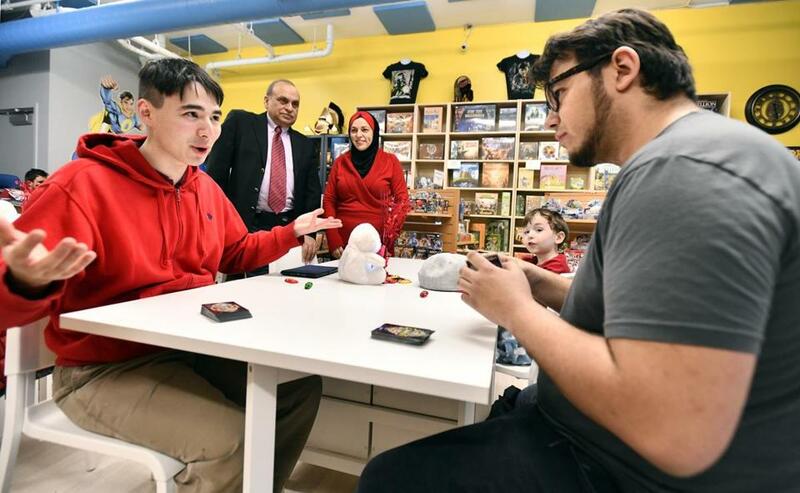 Tim Webb of Lextington (left) and George Groussis, event coordinator for White Wizzard Games, play a card game as Sohail and Mona Masood stand nearby.